See’s Candies - Treat your Sweetheart to a box of sweet candies from See’s. My favorite is a Custom Mix, a box of hand-selected chocolate. If you know what chocolates your valentine loves, such as dark chocolate with all nuts except peanuts, or milk chocolates with fruit filling, then you can choose just those special chocolates for your box. Discount gift certificates available at Costco. Multiple locations for See’s Chocolate stores, or order online at www.sees.com. One of the time-honored Valentines Day Ideas. Flower Ideas for Valentines Day - When ordering flowers, have them delivered 1-2 days in advance, so they can be enjoyed and admired before that special day. Or select a potted plant or flowering bulbs such as Dutch Iris, that can be planted and enjoyed for future years. Living plants make great Valentine Ideas! Romantic Bed and Breakfast - Extend your romantic weekend with Bed and Breakfast Getaway Gift Cards. These are a perfect last minute gift for your valentine. Sometimes you can find them at Costco at a discounted price. 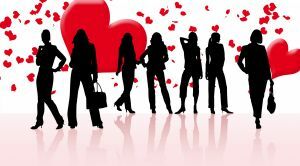 Romantic Weekend Trips - Valentine's Day is a great time to plan some romantic weekend trips. Each partner should plan a surprise trip, that is scheduled in different months. See these ideas for some romantic weekend trips. Romantic San Diego Dining in Dark - Surprise your date with a multi-sensual dining experience at Opaque restaurant, a dining in the dark experience. Call 800 710-1270 for reservations. Valentine’s Day Cruise - Treat the one you love to a romantic cruise on Valentines Day (or before). Cruise San Diego Bay with Flagship Cruises & Events (formerly San Diego Harbor Excursion). Call for reservations at (619) 234-4111. Couple's Massage - Enjoy a romantic San Diego spa treatment, such as a couple's massage at the W Hotel or Massage Heights. Wine Tasting - Spend the weekend in Temecula wine country, and try a wine tasting tour. Relax and enjoy! 14 Romantic Things - Surprise your valentine with 14 romantic things on Valentine's Day, or one romantic thing each day starting February 1. These can be small things that show you care - breakfast in bed, a foot massage. Use your imagination to come up with your own unique Valentines Day ideas and keep the romance alive. 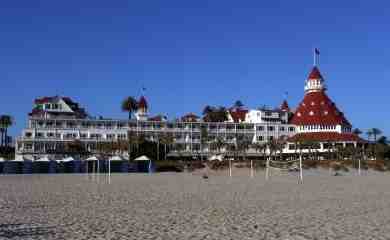 Romantic Valentines Day Ideas - Walk at the Beach - Enjoy a romantic walk at the beach at low tide in So Cal. Windansea Beach beach is a romantic beach, perfect for some romantic beach photos especially at low tide. 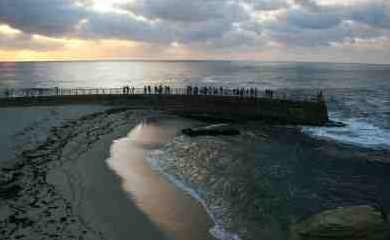 Children's Pool and La Jolla Cove are quite romantic. In north county, try Swamis and the views from the Self Realization Fellowship temple meditation grounds (closed Mondays). The Dinner Detective Interactive Murder Mystery Dinner Show on Valentine's Day - Dates and times varies. This is one of the unique Valentines day ideas. Join in the fun at this San Diego murder mystery dinner show, where murder and mayhem occur in a comedic atmosphere with a touch of romance on or around Valentine’s Day. The show takes place in the entire room, to keep you guessing who is part of the crime and not. The top sleuth wins a prize. These shows sell out fast, so make your reservations now. 888-619-0858. Sunday Brunch at the Del - Sunday from 9:30 AM – 1:00 PM Continuously voted San Diego’s best brunch by San Diego Magazine and The San Diego Union-Tribune readers, The Del’s brunch has long been a local favorite. Please call 619.522.8490 for reservations. For more Coronado valentine ideas, continue your day with a tour of Coronado, a sailing adventure, or a romantic walk on the beach. Hang gliding or Paragliding Adventures - Enjoy a romantic thrill from the air. 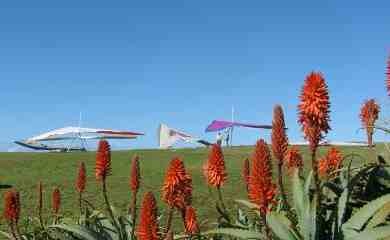 Try hang gliding or paragliding at the Torrey Pines Gliderport . A great bucket list Valentine's Day activity. Hot Air Balloon Rides - Try a hot air balloon ride over Del Mar California, or beautiful Temecula wine country for one of the thrilling Valentines Day Ideas. Make reservations now for Valentine's day or weekend. Several companies offer these romantic San Diego adventures, including California Dreamin, phone number 800-373-3359, Panorama Balloon Tours (800) 455-3592, or Ballooning California 800-877-7553.